In the spring of 2018, Field First was hired as a consultant by Freedom for All Massachusetts (FFAM) to support their campaign to uphold transgender rights in Massachusetts. In June 2018, Field First was promoted to campaign manager to win Yes on 3 and work with the campaign steering committee and staff to coordinate the fundraising, field, communications, operations, and coalition-building arms to lead the campaign to success. In 2016, a group of anti-LGBTQ activists collected enough signatures to put the Massachusetts law protecting transgender people from discrimination in public places on the 2018 statewide ballot as a referendum. Freedom for All Massachusetts needed to win a “Yes” vote on Question 3 in November in order to uphold these protections – this was the first time transgender rights were on a state ballot in the U.S., and the entire country was watching Massachusetts. While the “No” side was a fringe minority in MA, they had succeeded in similar efforts in other cities and municipalities across the country by exploiting vile, fear-mongering stereotypes that relied heavily on a voter’s lack of personal experience with transgender people. 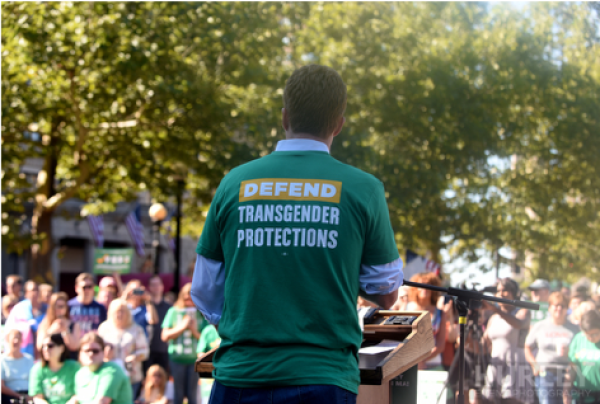 The No side was supported by national resources and looked to expand their attacks on transgender rights in Massachusetts, and to catalyze the next, nationwide wave of the anti-LGBTQ ballot measures. The Yes on 3 campaign knew from anti-LGBTQ campaigns in other states and cities that public opinion could turn very quickly, and that the public was especially susceptible to these fear-mongering messages. While the public generally was supportive of trans rights, many became concerned about allowing access to bathrooms and locker rooms based on gender identity when presented with the anti-LGBTQ activists’ messages. After looking at polling and examining the tactics used in other campaigns across the country, the campaign knew that in order to win it would have to run a robust, statewide public education campaign to inoculate voters against the opponent’s fear-mongering messaging and mobilize support. In June 2018, Field First stepped in to manage the campaign and worked across departments to drive the campaign forward. Field First made an immediate priority of developing a cohesive campaign plan which included an updated timeline, budget, hiring plan, and fundraising goals and then went to work executing the plan. Field First met weekly with the campaign’s Executive Committee and conducted regular meetings with senior staff and the broader campaign team to ensure clarity of roles and support day-to-day progress to goals. Field First worked closely with the coalition-building arm and fundraising arm of the campaign to better leverage the power of individuals, organizations and groups to invest their resources in the movement. 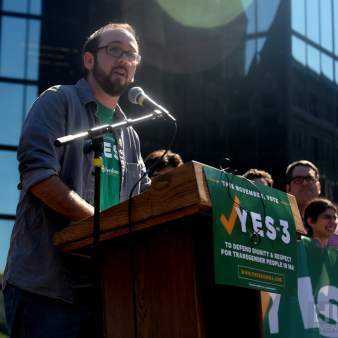 By the end of the campaign, Yes on 3 had built the largest coalition ever seen in MA comprised of nearly 1,500 businesses, labor unions, faith communities, LGBTQ groups, and other nonprofit organizations. Ultimately the campaign raised over $5 million from individuals donors, businesses, foundations, and unions. Field First worked closely with the field team leadership to build the grassroots program to scale through a statewide volunteer-powered field program and launch a paid canvass program in three priority cities. To track progress, Field First designed a reporting system to better analyze the effectiveness of public education conversations across field programs. In the fall of 2018, Field First planned and executed a 500-person rally in Copley Square, Boston with speakers from a myriad of sectors and supportive legislators and candidates. The rally had incredible representation in both the audience and in the speaking program, and resulted in increased visibility and momentum in the final weeks. Field First convened the team of communications professionals to develop an earned media strategy to showcase the stories of trans people and ease voters’ concerns with a public safety message. Field First managed the execution of a three million-dollar paid media program including the development and testing of digital, television, and radio ads targeted to the ‘moveable middle’ voter universe. The campaign’s main ad featured the story of Ian, a transgender teenager, and his family which tested highly in its ability to convey an effective empathy message to voters. Yes on 3 won, achieving a landslide 68% victory on the ballot. The campaign and its overwhelming victory made a major contribution toward the national movement for transgender equality. The Yes on 3 campaign lifts up a blueprint for how fights for transgender equality can be fought and won: a wide multi-sectoral coalition, a strong staff led by an effective executive committee, an earned media effort that communicates strength and builds empathy, a paid media program that includes serious investment in TV and digital, and a statewide field operation that uses an inoculation strategy.